Paris and Los Angeles based producer and distributor Cyber Group Studios and major kids’ content producer and digital media company YoBoHo, have joined forces for a brand new animated series, aimed at toddlers and preschoolers, across digital and traditional media outlets. Under this agreement, YoBoHo and Cyber Group Studios will coproduce and direct the digital content. YoBoHo will manage the online distribution of these programs worldwide, while Cyber Group Studios will adapt and coproduce the digital formats for television, including Captain FunTime YoBoHo’s upcoming digital 3D animated galactic comedy. 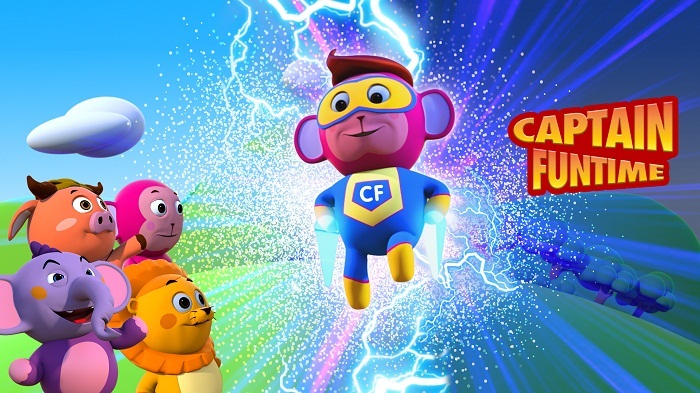 Captain FunTime is a hilarious 52×5 minutes series which revolves around the adventures of four best friends and their favourite super-powered pal named Captain FunTime. The programme along with other series will also be distributed worldwide by Cyber Group Studios. This new partnership will also see YoBoHo provide content management services for Cyber Group Studios’ vast content catalogue. YoBoHo brings a wealth of expertise to the partnership and with more than 1.5 billion monthly views, 90 owned and operated channels, and a library of 15,000 children’s videos, YoBoHo is among the worldwide top educational networks on YouTube for kids from preschool through high school. “YoBoHo’s vision to create world-class digital-first content aligns with the amazing team at Cyber Group Studios. This partnership allows us to leverage each other’s strengths in the creation and distribution of new original co-produced IP, reach out to newer audiences through traditional platforms, and further monetize the IP through the creation of consumer products. It’s a partnership with a lot of potential,” added YoBoHo New Media founder and CEO Hitendra Merchant. YoBoHo’s most successful IPs include: HooplaKidz TV, Los Juguetes Son Divertidos, All Babies Channel, HooplaKidz Franҫais, Casa Dei Giocattoli, Teehee Town and HooplaKidz.